Gaspar Yanga—often simply Yanga or Nyanga (c.1545-?) was an African leader of a maroon colony of slaves in the highlands near Veracruz, Mexico during the early period of Spanish colonial rule. He is known for successfully resisting a Spanish attack on the colony in 1609. The maroons continued their raids. Finally in 1618, Yanga achieved an agreement with the colonial government for self-rule of the settlement, later called San Lorenzo de los Negros and also San Lorenzo de Cerralvo. In the late 19th century, Yanga was named as a "national hero of Mexico" and “El Primer Libertador de las Americas", and 1932 the settlement he formed, located in today's Veracruz province, was renamed as Yanga in his honor. 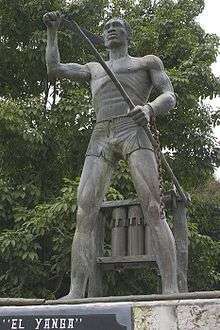 Yanga, aka Nyanga, was said to be of the Bran people and a member of the royal family of Gabon. He was captured and sold into slavery in Mexico, where he was called Gaspar Yanga. Before the end of the slave trade, New Spain had the second-highest number of African slaves after Brazil and developed the largest free black population in the Americas. In 1871, five decades after Mexican independence, Yanga was designated as a "national hero of Mexico" and El Primer Libertador de las Americas. This was based largely on an account by historian Vicente Riva Palacio. The influential Riva Palacio was also a novelist, short story writer, military general and mayor of Mexico City. In the late 1860s he found in Inquisition archives accounts of Yanga and of the 1609 Spanish expedition against him, as well as the later agreement. He published an account of Yanga in an anthology in 1870, and as a separate pamphlet in 1873.:4 Reprints have followed, including a recent edition in 1997. Much of the subsequent writing about Yanga was influenced by the works of Riva Palacio. 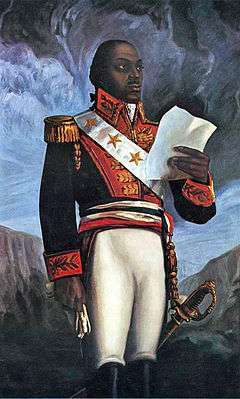 He characterized the maroons of San Lorenzo de los Negros as proud men who would not be defeated. 1 2 3 4 Curto, José C. and Renée Soulodre-LaFrance. Africa and the Americas. Africa World Press: Trenton, New Jersey. 2005. pp. 174-177. ↑ Rodriguez, Junius P. ed. Encyclopedia of Slave Resistance and Rebellion. Greenwood Press: Westport, Connecticut. 2007. 1 2 3 4 5 6 El Primer Libertador de las Americas/The First Liberator of the Americas", Editor's Notes. Callaloo 31.1 (2008). pp1-11. ↑ "Gaspar Yanga and Blacks in Mexico: 1570 African Slave Revolt in Veracruz". Black History Heroes. Retrieved 25 October 2015. Charles Henry Rowell, “El Primer Libertador de las Americas: Editor's Notes”, Callaloo 31:1 (Winter 2008).